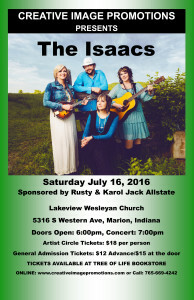 Saturday July 16th at Lakeview Wesleyan Church in Marion, Indiana. Artist Circle Tickets are $18, General admission: $12 in advance and $15 at the door. Sponsored by Rusty and Karol Jack Allstate! Get your tickets today!